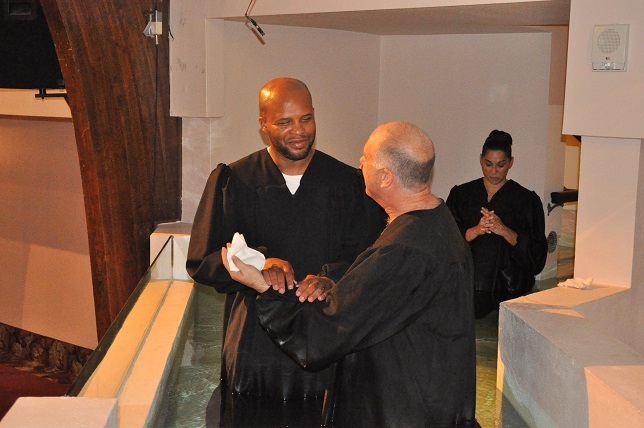 Click here for Baptism pictures and stories. I would like to become baptized in the Seventh Day Adventist church and faith. How do I go about doing this? That is wonderful Pamala! Please e-mail me at laypastor@TampaAdventist.net and include in the email your city and country and contact info so we can help you with the next step. I am an S. D. A. Member at the Henderson Hwy. Church for 36 yrs. in Wpg. Mb. We’re taking a trip to Puerto Vallarta Mex. in Jan. first time doing this. My wife is not a member. I coaxed her all these years to get baptized at the church. But no way. But what does a Bible believer do like myself when travelling somewhere, you check for an S. D. A. Church there. I did that on my IPad. I found couple a couple churches in Puerto Vallarta and on that day they were baptizing a bunch of people in the ocean by a couple pastors. That gave me an idea. So after coaxing her and explaining what baptism means and salvation. She agreed and wants to be baptized in the ocean there. Thank God ! I just hope it works out. I hope Satan doesn’t get his way. I am not familiar with area there. And finding a English S. D. A. Church there. I’ll have to pray a lot and ask for the Holy Spirit to come to us.